PERFECT LOCALISATION in the heart of the ALGARVE, a region mostly appreciated for its nice climate, the warm welcoming of its inhabitants, and its numerous tourist attractions. THE HOUSE CAN RECEIVE UP TO 6 PEOPLE: kitchen – living room – dining room – 3 bedrooms – 2 fully equipped bathrooms (basin, bidet, bath and toilet) – independent toilet. THE BEST PLACE FOR RELAXING HOLIDAYS: the house is a very comfortable, you will feel at home. The price includes the cleaning of the house 3 times a week and at the end of your stay. The household linen is furnished and cleaned. If asked for, we can provide you with food or anything you need from the local grocery store for your first night and an your first breakfast (to be paid on your arrival in the house). FOR THE OUTDOOR LIFE: there is a private swimming pool (8m x 4m, depth: from 0, 80 cm to 2.2 m) on the terrace offering a wonderful sea sight. The garden is very nice and flowery, and you will be able to use the stone-made barbecue. There is a security barrier down the stairs leading to the swimming pool and to the solarium (located on the house rooftop). THE HOUSE IS UNAVAILABLE IN AUGUST, but we still have SOME AVAILABILITY for the rest of the season (see calendar). ATTRACTIVES PRICES for the low and middle seasons. FORMALITIES AND MOVING are very simple. MULTIMEDIA: French TV by satellite, as well as 70 channels in many different languages. Free Wi-Fi available. A multifunction printer is also available (user charges will apply). OTHER STRONG POINTS: see equipment category. We are a working couple living in an appartment in the “Hauts-de-Seine” region, very close to Paris (France). The property has an “Alojamento local Portuguese n° 12901/AL”. The same nice and trustful person has been in charge of the cleaning for many years. Another sympathetic and trusted person represents us in Portugal and is in charge of the stewardship. She speaks Portuguese, French, English and Spanish. Reservation management is taken care of by our welcoming, competent and available partner. Formalities are made very simple by the use of on live reservation from individuals to individuals, but we make sure that you have a serene time with us by offering you many guarantees of reliability (contract, payment, fully-comprehensive insurance…). A Welcome Booklet with many useful information will be sent to you by mail to make sure that you will arrive in the best condition in our charming house. A bathroom is adjoining the first bedroom, the two other bedrooms share another bathroom. The box’s security key is provided in your Welcome Booklet. For the families who love cooking, the kitchen is fully equiped. The living room and dining rooms are separate spaces but communicate through a large opening. The terrace is equipped with tables, chairs, a parasol and a stone-wall barbecue. If you have a disability or special need, contact the owner for further information. Swimming maintenance assured regularly. Sun loungers and mattresses are available. Additional equipments: For the outdoor life, there is a garden and a set terrace (stoneworker barbecue). There is also a security barrier down the stairs leading to the swimming pool. 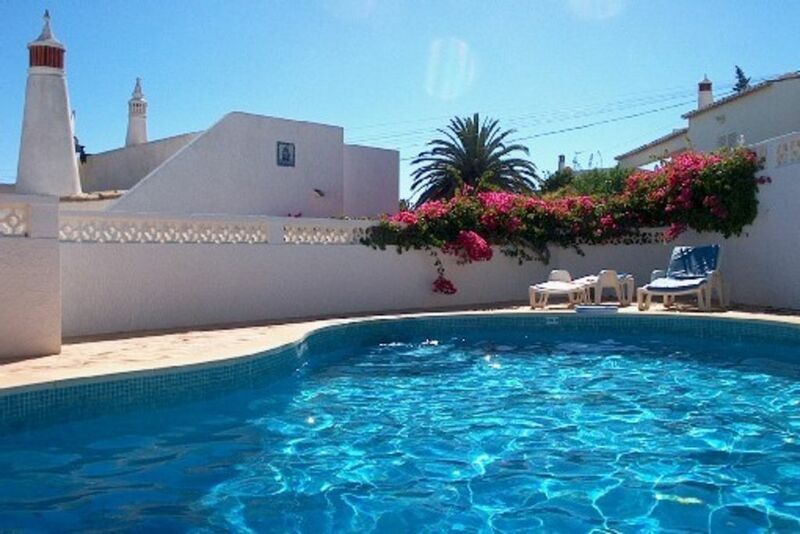 Casa NOSSI-BE is located 5mn (in straight line) above a lovely fishermen town called Praia da Luz, which offers a possible walk on the seafront, a big nice beach and nautical sports, shops of every kind, bars and seafood restaurants. There are three golf courses within 10 km (BOAVISTA, PARQUE DA FLORESTA, and PALMARES), and horse-riding clubs, nice walks to take in the surrounding countryside. The nice town of Lagos, characterized by bulwarks facing the marina, a harbour, pedestrianized streets and a famous animation, is really close.